Although Switzerland based crypto exchange ShapeShift has recently fired a third of its staff and announced structural changes to the company, they do not intend to divest any of their current subsidiaries at this time, Emily Coleman, Chief Marketing Officer at ShapeShift, told Cryptonews.com. 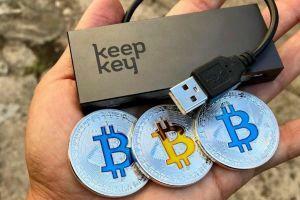 "We are going to be offering a new ShapeShift version in the spring and KeepKey [their cryptocurrency hardware wallet] will be highly involved in this product. We are keeping all of our current offerings, just consolidating and refining our offerings as Erik [Erik Voorhees, founder and CEO of ShapeShift] alluded to in the blog post we released," Coleman said. She declined to elaborate any further. Besides KeepKey, Shapeshift owns CoinCap, a real-time crypto market data website, and Bitfract, "the only tool in the world that allows you to trade one input currency for up to 62 crypto assets in a single transaction." Last week, Erik Voorhees, founder and CEO of ShapeShift, admitted that the exchange diversified too soon: "Our attention branched in too many directions, too early." The most recent acquisition was made last August, when the company bought aforementioned Bitfract, an Austin-based software firm. "With this acquisition, ShapeShift further extends its reach into the blockchain industry and lays the foundation to expand its offerings," the exchange said at the time. Meanwhile, one of the main players in the hardware wallet market, KeepKey was acquired by ShapeShift for an undisclosed sum in August 2017, although they had been partners for longer: KeepKey integrated ShapeShift’s API (application programming interface) over a year before that. After the acquisition, ShapeShift said that the KeepKey brand and product line would remain the same, following high demand by users, and the acquisition would also provide increased capital for inventory and security expertise. In more recent news, KeepKey announced that its chief engineer Ken Hodler left the company in November. He was working with the KeepKey product since 2015. 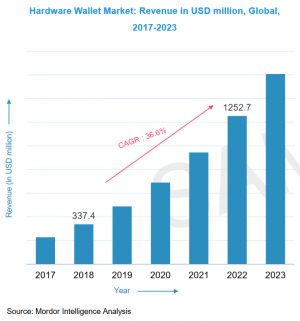 The global Hardware Wallet Market was valued at USD 227.5 million in 2017 and is expected to reach a value of USD 1.6 billion by 2023, according to Mordor Intelligence, a market research company. USB type of hardware wallet is expected to hold highest market share by type and is expected to reach a value of USD 1,31 billion by 2023.